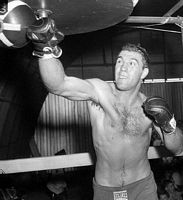 Rocky Marciano: Is He a Top 5 All Time Heavyweight? "Show me a fighter whose undefeated and I'll show you a fighter who hasn't fought anybody." --Whitey Bimstein, legendary boxing trainer. In the 2005 IBRO (International Boxing Research Organization) polling of its members, most of who are authoritative historians with research backgrounds or boxing writers, Rocky Marciano was rated # 5 amongst the celebrated heavyweights of history. A couple of members remarked their surprise at Marciano’s high rating. Obviously a solid majority thought highly enough of Marciano for him to finish in the top five. How good was Rocky? Was he an all time great? Is he overrated as some contend or underrated by the majority of younger modern fights fans? Is he a deserving top 5 all time heavyweight champion? Rocky Marciano is the only unbeaten and untied boxing champion in history. 49-0 is his legacy. Of his 49 wins 43 came by way of knockout. His knockout percentage of 87.75 is the highest among all heavyweight champions. He is 7-0 in title fights. On his accomplishments alone he deserves consideration for a spot among the ten best heavyweights ever. To determine whether he deserves a top 5 spot one needs to look closely at Rocky the fighter and his record. One of the biggest knocks on Marciano is that he was small for a heavyweight when compared to more modern heavyweight punchers. Rocky’s physical stats were 5' 10 1/4" and 184-185 pounds in his prime, which is fairly small. His reach was 68” - 4 inches shorter than Floyd Mayweather, for example. Despite his lack of size Marciano was a great pound for pound puncher. He was physically strong with superb tendon strength and he never entered the ring in less than top condition. Rocky brought punching power, a high work rate, endurance, durability, excellent conditioning and the will to win into every fight. He also carried his power into the late rounds, which is a short list of punchers of which only Joe Louis and Joe Frazier definitely belong with Marciano. Rocky came inside low in his crouch to get underneath his opponents and was not as easy a target to hit as some fans think. He was unceasing in his firing of his hammer blows at his opponent’s, although he lacked punching accuracy. Rocky was an “anywhere hitter” but anywhere he hit, he hurt. Rocky was known to bust the blood vessels in his opponent’s arms as they covered up trying to protect themselves from the onslaught. He nearly clubbed Carmine Vingo to death; he survived but was never able to fight again. Ring Magazine founder Nat Fleischer wrote that in terms of boxing ability Marciano was "crude, wild swinging, awkward, and missed heavily. In his bout with light heavyweight champion Archie Moore, for example, he missed almost two-thirds of the fifty odd punches he tossed when he had Archie against the ropes, a perfect target for the kill." 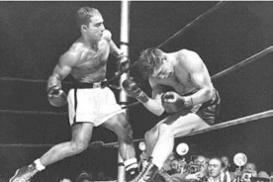 However, in fairness to Marciano, he was a stubby armed swarming style fighter, not a boxing master. He certainly wasn’t in there to outbox anyone. He had to get inside and let his hands go, and that is what he did. He got the results that were required of him as his high knockout percentage attests to. Since Marciano’s claim to greatness is based largely on his unbeaten record one must put his quality of opponents under the microscope. It is true that most of Rocky’s best opponents were past their prime when he faced them. Jersey Joe Walcott was 38-39 years old, Ezzard Charles was 32-33 and was at his peak at light-heavyweight and 175 pound champion Archie Moore was 42. One of the best men Marciano defeated prior to winning the title was Rex Layne. Layne lost often when he stepped up in competition. Another of the top contenders Marciano faced was Lee Savold whose career record was 89-37-3, hardly inspiring. Rocky came up in one of the weakest periods in heavyweight history, in fact the only era that is weaker than the early mid 50's amongst heavyweights is the current crop. Joe Louis was the biggest name on Marciano’s resume, but he was 37 years old and had lost much. By the time of their fight the once legendary Louis had “long since lost his once devastating punch” as Nat Fleischer wrote. This is true because Louis depended greatly on speed, timing and sense of distance for his hitting power. His lost reflexes robbed him of his explosiveness and therefore his punching power. Louis still was a solid fighter when Marciano beat him because he was fundamentally sound, but he lacked the speed and power that he once possessed. In a comparison Joe Louis fought much better competition than did Rocky Marciano. Marciano never fought the big 200 pounds plus hitters and giants that Louis did. The only top notch heavyweights that Marciano defeated who weighed over 200 pounds were a fat Don Cockell who weighed 205, and Joe Louis in his last fight. Louis, on the other hand, defeated Primo Carnera who was 6’6” 260 pounds, Max Baer 6’ 3” 210 pounds, Buddy Baer 6’5” 237 pounds, and Abe Simon 6’4” 260 pounds. Louis was at his absolute best against the big men because of his speed and explosive power. Rocky’s chin was never tested against a really big first tier heavyweight puncher. The two best punchers that he did fight, Jersey Joe Walcott and Archie Moore both put him on the canvas. Marciano would be favored over the giants that Louis defeated, but he simply never faced anyone of such size and strength in his career. Could Marciano make 25 successful title defenses against Louis competition? Possibly, but he would have struggled more doing so. He made only 6 title defenses and decided to rest on his laurels. When looking at Marciano’s opponents one must ask the question “Is there one person that Marciano beat that Joe Frazier would not beat?” The answer is clearly no. Joe Frazier would have little trouble with Marciano’s opponents and would easily have gone 49-0 against them. Frazier’s only career defeats were to Muhammad Ali and George Foreman. How would Marciano have fared against Frazier’s opponents? Marciano would be an underdog to Ali and would likely lose a decision. Ali was more susceptible to a left hook, Frazier’s bread and butter punch, than he was to a right hand, which was Rocky’s best shot. Cus D’Amato once said that, “No swarming heavyweight who ever lived could beat George Foreman coming to him.” Marciano would have had the same trouble trying to get inside George’s long arms and massive uppercuts, as did the bobbing and weaving Frazier. It seems highly unlikely that Marciano could overcome the freakish power of the much larger Foreman in a slugfest. Frazier holds a win over Muhammad Ali and defeated other quality heavyweights such as Jerry Quarry who were superior to most of Marciano's competition. Had the two all time greats switched era's Frazier would have been 49-0 and Marciano would likely have had losses to Ali and Foreman on his record. Who were the lineal champions since Jack Johnson who would not be favored over Marciano’s competition? Jess Willard, Jack Sharkey, Max Schmeling, Primo Carnera, Max Baer, Jim Braddock, Floyd Patterson, Leon Spinks, Mike Spinks, and Hasim Rahman is a short list in the nearly 100 years of boxing history since Johnson. After the LaStarza fight Marciano's handlers were afraid to put him in with anyone who could fight. His next opponent was Eldridge Eatman who had lost 8 of his last 9 fights. Tiger Ted Lowry who had a career record of 60-54-9, went the distance with Marciano. Others such as Harold (Kid) Mitchell, Art Henri, and Willis Red Applegate all had losing records. It is little wonder that Rex Layne was a 9-5 favorite over Marciano when Rocky finally stepped up in competition. It should be noted that Layne was no world beater, like most of Marciano's top opponents Layne weighed well under 200 pounds and he finished with a career record of 50-17-3. Today it is common to see Marciano rated over Jack Dempsey on many all time lists, mostly because of his undefeated record. Such views are completely revisionist when compared to those who actually saw them both fight. Anything that Marciano could do Jack Dempsey could do better. Dempsey was nearly as strong a puncher with his right, stronger with his vaunted left hook, had much greater hand speed, was more maneuverable, a better boxer, had a better jab, was more cut resistant, was a faster starter and was just as tough and durable. Consider that in the Dec. 1962 Ring magazine poll of 40 boxing experts it was Jack Dempsey that was rated the # 1 Heavyweight of all time with Joe Louis 2nd, Jack Johnson 3rd and Marciano finishing a distant 7th, way behind Dempsey. If he was considered 7th in 1962 how does he propel to the top 5, when since then we have had Muhammad Ali who faced much tougher competition, the big power hitting George Foreman, Larry Holmes who made 20 title defenses, the bigger, faster and more powerful Mike Tyson, and the giant Lennox Lewis who at 6’5” 245 pounds would enjoy a 60 pound weight advantage over Marciano? This is a key point. Nat Fleischer rated Marciano at # 10, Charley Rose rated him at # 8, McCallum's survey of old-timers had him at # 9. No major historian who saw Maricano in their lifetime thought he was a top 5 all time heavyweight and 50 years have passed since Rocky retired as champion. The caliber of opponents is most important in evaluating greatness. Tommy Morrison and Roy Jones, for example, looked great against lesser opponents but pitted against the top men of their class, their shortcomings in other assets were exposed and their ability was offset by other attributes that better opponents of theirs possessed. Marciano was never so tested because his level of competition was so weak. 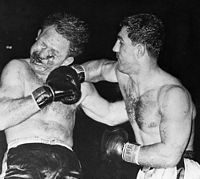 Rocky Marciano was a great, but limited slugger who is admired for his toughness, endurance, conditioning and punching power. When rated against the other all time greats he compares to them in punching power only. He lacked the fundamental skills of Joe Louis, the quickness on attack of Jack Dempsey, or the quality of opponents of Joe Frazier. Marciano’s place can be argued amongst the top 10, but top 5 seems too high due to his lack of competitors. If Rocky were 48-1, he likely would not make the cut at all.